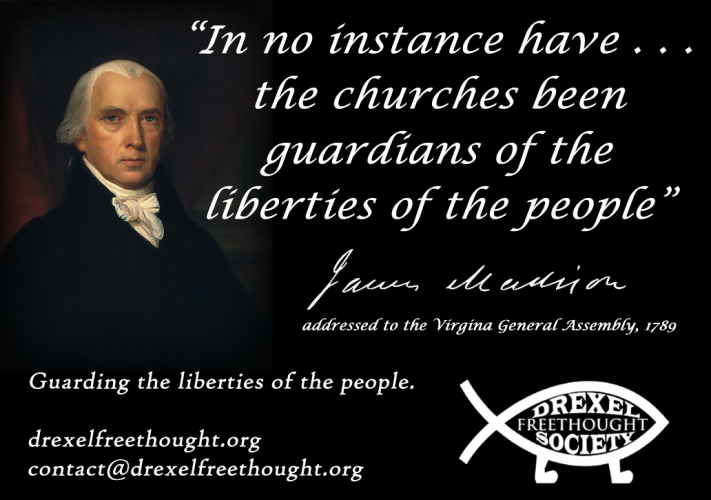 Freethought is a philosophy that supports science, logic, and reason as the foundation for understanding our universe. Freethought utilizes the scientific method, and discourages dogma as well as supernatural and paranormal explanations. 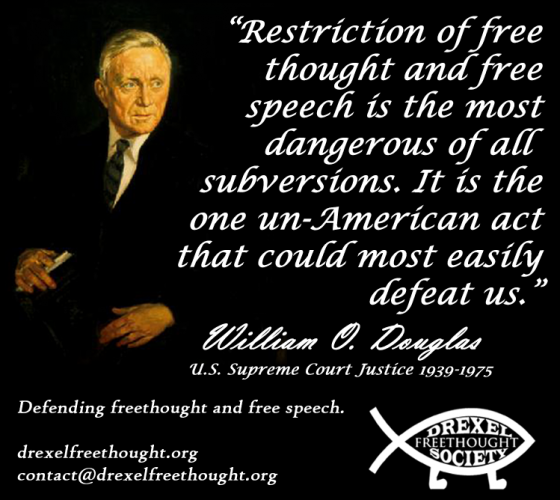 The Drexel Freethought Society (DFS) is an organization dedicated to encouraging the free and open exchange of ideas at Drexel University. 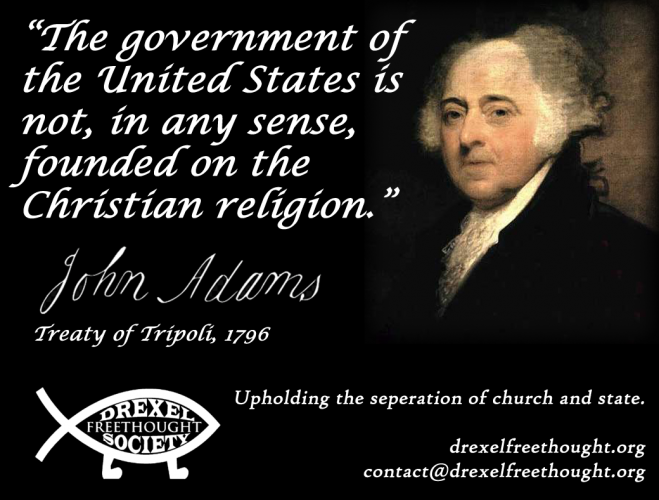 The DFS supports Drexel’s community of atheists, agnostics, secular humanists, skeptics, and freethinkers. We push for keeping personal indemonstrable beliefs to a personal level, while promoting science and reason, separation of church and state. We act as a responsive organization to harmful beliefs, while fostering the ideals that make us all equal and all human. 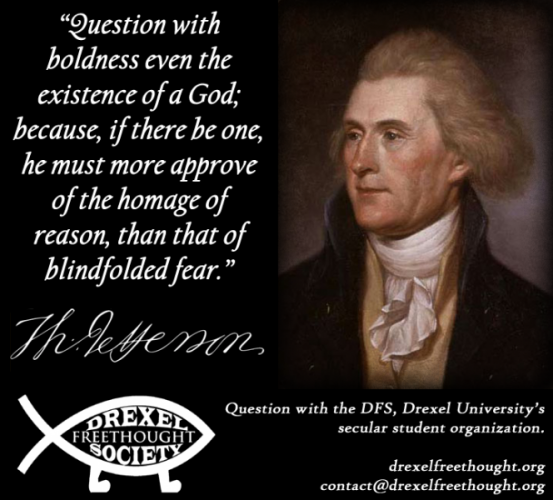 What does the Drexel Freethought Society do? The DFS organizes weekly meetings on Thursday nights at 6 pm. Check our calendar for up-to-date time and location of all DFS events. 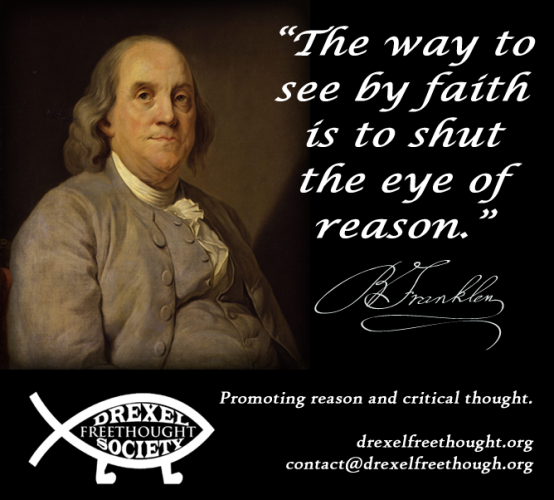 Our main goal for the Drexel Free Thought Society is to respond to the harmful personal beliefs of others and to give none believers a place where they can be around like minds. We will work in conjunction with many other organizations in the area to host new events that promote reason and discourage blind unintelligible beliefs that cause harm. If you’re interested in working with us in the community, or simply want to have a lively discussion, please get in touch with us at drexfreethought ‹at› gmail ‹dot› com. Past DFS events have included an Evolution Coffee Talk with Drexel University Professor Lloyd Ackert, a screening of Carl Sagan’s Cosmos, a screening of Julia Sweeney’s Letting Go of God, and participation in a Drexel University Intercultural Holiday Party. Check our Photos section for pictures of these events, or email contact <at> drexelfreethought <dot> org to submit your own photos! We are planning new events with other free thinking organizations in the area. Meetings for the fall term 2012 will be held every Thursdays at 6 pm. Events and special meetings will be posted. You also have the opportunity to go to many other organization’s meetings that we work with. These meetings will also be posted on the calender or linked too. How can I join the DFS? It’s easy! First you must be a student of Drexel University (both undergraduate and graduate students are welcome!). That’s the hard part. After that, you just need to attend our meetings and events. Only students that regularly attend meetings will be allowed to vote in the DFS elections so make an effort to stay active in the group! Do I have to be an atheist to join the DFS? No, the Drexel Free Thought Society is an inclusive organization. We are a group that wants everyone with an open mind to join and participate. We try not push atheism at our meetings, rather we open up our events to discussion and dissent. We encourage you come to an event or a meeting, we have a strict code of conduct, and all love a great debate. Please come to one of our meetings or events, we’d be happy to have you! Are there membership dues for the DFS? No, you do not have to pay any money to join the Drexel Free Thought Society. Why don’t you get Richard Dawkins to speak at Drexel? Don’t worry we are working on it and even if we cannot get him here, we work very closely with many other organizations who may be able to host him instead.